Yippee! It’s nearly Friday and half term is looming. Nearly time for a break from school runs and the chance to spend some family time together – which is a R2BC in itself – hopefully without too many squabbles. Erm, yes me! I’ve started jogging, with a view to increasing stamina and fitness. 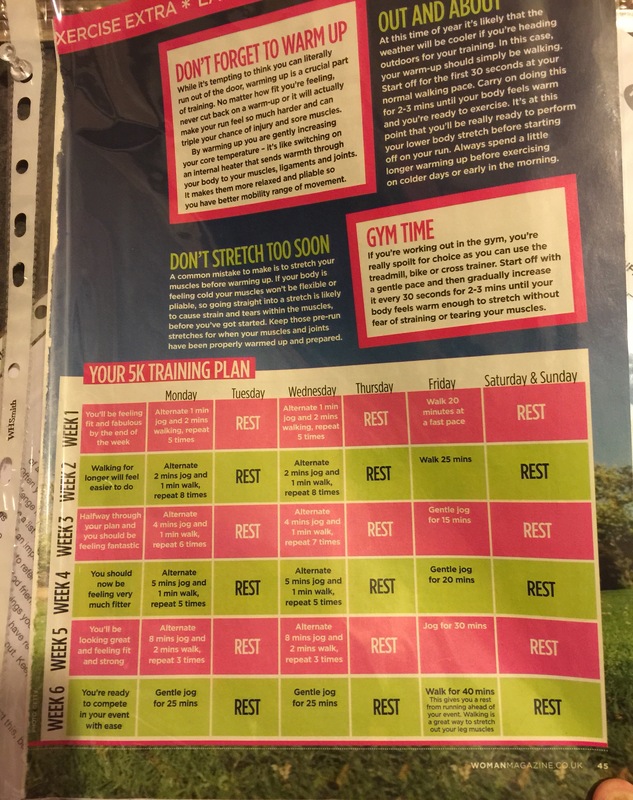 I’m following the schedule above and there have been achy thighs but I’m enjoying it. Hopefully T and D will be amenable to a bit of jogging around next week as I’d like to keep it going. D attended a girls football tournament this week and earned herself 3 house points for playing in defence. She struggles with team play and had anxieties in bucket loads over the change to routine but did very well. We are a very football-orientated house as Hubbie and T are heavily involved in “the beautiful game” every Saturday, so it was a proud Daddy moment when she showed us her certificate for taking part. I kicked a big phobia up the backside this week, feeling extremely positive about it. I am feeling so much better in myself, getting more achieved (rather than putting things off) and my doctor remarked on how much happier I was at my appointment today. I am, it’s true. I’m enjoying going for the 10,000 steps target a day, sometimes 2,000 or so over. I’m hoping to keep that up during half term. …to all this increased activity and happier thoughts is that I’m 4lb down in the last couple of weeks. Very pleased. A word to sum up our week? It’s been a good one – anxieties aside. Let’s see what half term brings. Bright Side of Life on 13th February 2015 at 5:45 am. Fabulous reasons. I really do think that exercise is so beneficial for our peace of mind as well as health and weight loss. Jeannette on 24th February 2015 at 9:05 pm. Jocelyn (@ReadingRes) on 13th February 2015 at 3:39 pm. Jeannette on 24th February 2015 at 9:04 pm. Jane - Our Little Escapades on 13th February 2015 at 4:23 pm. Merlinda Little on 14th February 2015 at 9:11 am. Jeannette on 24th February 2015 at 9:03 pm. xOjox on 18th February 2015 at 12:31 pm.